I hold a Doctorate in Chinese Medicine from the American College of Traditional Chinese Medicine in San Francisco, a leader in the field of acupuncture and Traditional Chinese medicine. 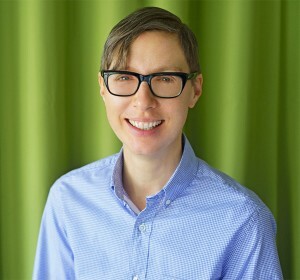 I am a nationally certified, licensed acupuncturist and herbalist with a strong focus on manual therapy and biodynamic craniosacral therapy, which I studied in depth while obtaining my Master’s degree (2003) at the highly regarded New England School of Acupuncture (NESA) in Boston, Massachusetts, the first acupuncture school in the United States (1975). NESA remains one of the most prestigious academic institutions in the field. 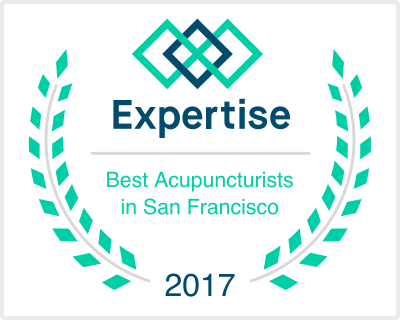 I was chosen by Expertise as one of the top acupuncturists in San Francisco in 2017, 2018 and 2019. I am certified by the National Certification Commission for Acupuncture and Oriental Medicine as a Diplomate of Acupuncture, Herbal Medicine, and Oriental Medicine. 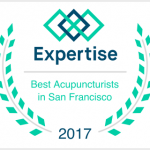 I have been in practice in San Francisco since 2004 and hold the unique distinction of being the first graduate of NESA to sit for the California Acupuncture Board exam (2004). I am licensed to practice in both California and Massachusetts. My first year of practice was in Brookline, MA, and on staff as an Acupuncturist at Pathways, a public health acupuncture clinic in Boston. At Pathways, I also worked on a research project looking at the effects of the relaxation effect and acupuncture in patients with HIV. 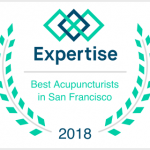 Upon moving to San Francisco in 2004 and starting my private practice, I worked as an Acupuncture Shift Supervisor and Acupuncturist at Quan Yin Healing Arts Center in San Francisco, a public health clinic. For the following three years while also in private practice, I volunteered at Charlotte Maxwell Complimentary Clinic, a volunteer-led program serving low-income women with cancer (primarily breast cancer). I was chosen by the California Acupuncture Board to be a Subject Matter Expert in the development of the state acupuncture licensing exam. I continue to be involved with Exam Development and now have worked with the Board since 2009.